Transfer Factors help create antibodies. Antibodies are like little soldiers that scour the dogs body, seeking and destroying damaged cells! What sets K9Medicinals Apart From Competitors? We are a family business, who started selling these products after our own dog was diagnosed with cancer and given two weeks to live. K9Immunity extended our dog’s life by two years. We are passionate about helping others going through this trauma and want to keep healthy dogs well so no family has to go through what we did. All of our products are made in the U.S.A. and all of the ingredients are made in the U.S.A. as well. They are formulated in FDA certified laboratories to human grade standards. They are safe, organic, natural and have no known interactions with any other supplement or medication. They are safe for even pregnant or nursing canine mothers. Some other companies advertise their products are made in the U.S.A., but the ingredients come from other countries who have no safety standards. We have a full money back guarantee and a wonderful support system for our customers and their canine family members. Transfer factors are proteins your dog naturally produces. These proteins join with other immune-specific molecules to create antibodies. Antibodies are like little soldiers that scour the body seeking and destroying damaged cells. But when your dog has cancer, he’s can’t produce the amount of transfer factors he needs. And without enough transfer factors, he can’t create the antibodies he needs for stronger health. That’s why we created K9Transfer Factors. 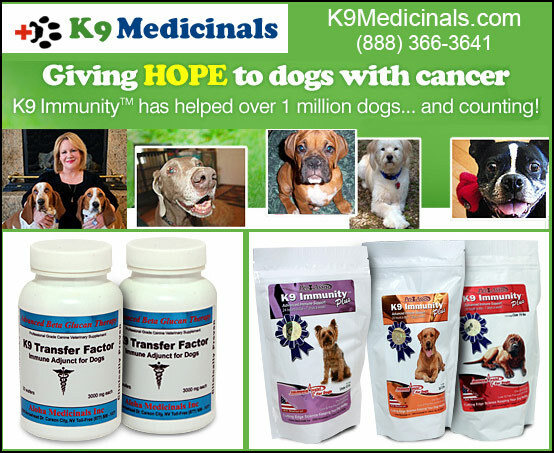 Transfer factor supplements alone aren’t known to have any effect on dogs with cancer. But if your dog is taking K9 Immunity, we HIGHLY recommended using K9 Transfer Factor in conjunction. There are many brands of transfer factors available in health food stores. Both human grade and canine grade work with K9 Immunity. However, our manufacturers invested over three years researching with a major veterinary nutrition company to develop the ultimate transfer factor for maximum effectiveness. And K9 Transfer Factor comes in an easy to chew, liver flavored wafer dogs love. K9 Immunity strengthens and balances your dog’s immune system so the body recognizes and destroys damaged cells. This improves their body’s ability to overcome illness and helps protect them against future illness. K9 Immunity Plus is an intense immune-boosting daily supplement designed to provide maximum support for dogs with cancer. And it comes in a convenient, easy to administer form. Transfer Factors Increases the formula’s effectiveness and results. The immune-active polysaccharides in K9 Immunity work by bonding with your dog’s immune proteins. Transfer factors are needed for this bonding to occur.The added transfer factors increase the number of naturally-occurring bonds. In turn, this activates a greater number of immune cells for better results. Omega 3 Essential Fatty Acids Omega 3 essential fatty acids are well-studied to help shrink tumors, lower inflammation and provide a host of other health benefits. Making it more pleasant for your dog, K9 Immunity Plus comes in easy to chew wafers with natural liver and fish flavors dogs love. What Symptoms Should I Look For To Alert Me To A Poor Immune System? Boosting the immune system for proper working biochemical interactions is important to your dog’s wellness. The immune system is constantly protecting the body from parasites, bacterial, fungal, or virus-infected cells. Boosting your dog’s immune system will help his body overwhelm bacteria, destroy toxins, or kill viruses. Infected cells produce interferon and other cytokines, which can signal contiguous uninfected cells to intensify their defenses, enabling them to damage invaders. In a weak immune system, bacteria, viruses, micro organisms, and toxins can pass the immune defending cells, and generate disorders. A lowered immune system function in dogs results in acute or chronic fungi, allergies, yeast infections, eczema, demodectic mange, food allergy, arthritis, ear infections, slowly healing wounds, or fertility disorders. What If My Dog Is Healthy, Can These Products Still Help? YES!! Absolutely, they can help. Our goal is to help your healthy dog stay healthy and your sick dog heal and have a good quality of life and extended years with your family. Order Transfer Factors For Your Dogs Immune Health Today! Make sure your dog has a healthy immune system to fight off disease, infection and to help support general well being and joy in their every day lives by using products from K9Medicinals. For more information about our immunity line of products, please call us today!